While the appeal of the opening bonus codes and deal may hold their own allure, there’s plenty more which you should be taking into account if you are interested in becoming a long-term player here. UP TO £800 BONUSNew Customer Offer. T&Cs Apply. 18+. Please Gamble Responsibly. Join the land of casino at Casino Land. The site offers a whole world of different games and promotions you will love. CasinoLand review pages such as this one are set up to ensure that you get the full lowdown on what makes the site tick, from its opening deals to its games library, casino features and more besides. Therefore, we have done some serious digging to look into all you need to know when it comes to signing up here and really making the most of the games and features on offer. In general, it’s a new casino site which is recommended by several reviewers and experts, this means we already have plenty of confidence in how it will stand to perform with the wider public. Boasting support from a range of big-name developers and designers, it’s little wonder why there are so many great games to pick from here – the brand leads with an appealing design which is clearly optimised for mobile play, and in addition to this, working your way through various games categories and types has never been easier. Before we get too deep into the nitty-gritty, however, it’s good to consider just how worthwhile these opening deals actually are – and how far they will go in facilitating your opening games, and your interest in the brand at large. Let’s take a look to see just how good the opening CasinoLand bonus codes actually are for the money you stand to put in! 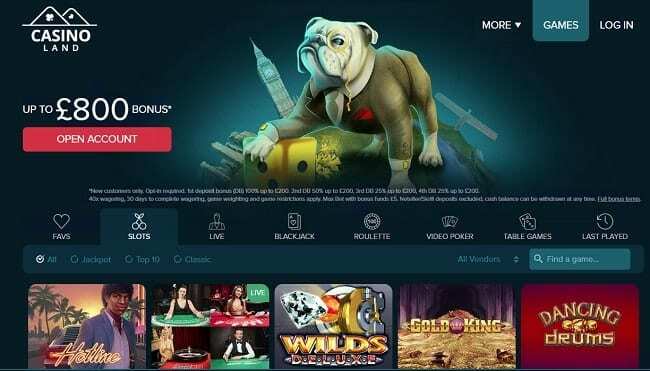 While no deposit bonus codes may come and go – and while the CasinoLand sign up bonus may have changed a little bit over the last few years, the current offer for April 2019 is very solid indeed. Based around the popular concept of cash matching, the opening welcome deal here is designed to help you get the most out of your money, meaning that depending upon how much you cash in, you’ll be able to grab a certain amount back to use site-wide. The opening deal allows you, in total, to grab up to £800 to play with – but it’s important to understand just how that breaks down before you get any further in. On your first deposit, get 100% cash matching on anything up to £200, right off the bat. On your second deposit, claim 50% on anything up to, again, £200. You can claim another cash match on your third deposit, too, a further 25% on anything up to £200 – and, unlike many casinos, there’s even a fourth deposit deal here, with another 25% being available up to £200. All in all, that’s up to £800 in free bonus cash which is up for grabs. Not bad at all. It’s important to take into account terms and conditions, but they are at least up front about wagering here, definitely look into the additional details before you sign up, but rest easy on the grounds that you’ll only be expected to wager 40x your bonus to be able to cash out. This is fairly competitive – and what’s more, the bonus is apparently cashable – and you’ll never be wagering with any money you deposit. You’re going to need to make sure that you deposit at least £20 to access this deal, but it’s well worth going for, we’ve seen far more restrictive offers elsewhere on the internet at bigger and smaller brands. There’s no maximum win in play, though if you are interested in depositing with either a Skrill casino payment or Neteller, you won’t be eligible to claim your free casino bonus. This, unfortunately, is becoming fairly commonplace across a number of online casinos at present. Alongside this welcome offer, there appears to be a regular deal running every Tuesday – but beyond that, things do seem a little sparse on the promotion front. Regardless, the opening deal alone should keep you running for long enough on your first four goes to disregard this. Generally, however, we would like to see more of a focus on ongoing promotions and deals to improve our CasinoLand review. Check out our Wild Wins review to see another brand with great bonus offers. While there’s a nice variety of games, tables and live experiences here, as well as progressive jackpots, some players may find that there may be a bigger variety and range elsewhere. There’s just shy of 200 slots games to pick from here, along with a handful of table, poker and live casino games, while the focus here does seem to be on slots, the name of the site and its apparent branding suggests otherwise. The games and the casino standards at CasinoLand are, at least, appealing and do work well across various devices, but for many players, a wider range wouldn’t go amiss. For those who have played their fair share of games across other gaming networks, there are a few titles which will be genuinely new, meaning that, at the very least, the spread put on here is a breath of fresh air in some ways. We found the games selection at CasinoLand really impressive, and their selection of deals and bonuses is great for new and existing players. The live games are very well-maintained and even work on the go, this means that despite the relatively small supply of titles here, what’s lined up really does work well. This is a great plus point for our CasinoLand review as we know players love a good selection of games. As mentioned, the games library largely takes from NetEnt gaming’s brilliant catalogue of games and casino tables and standards, meaning that if this is a brand name you enjoy, you really are heading in the right direction. However, as always, extra support from other software developers can’t hurt – Microgaming, Play’n Go, Shufflemaster, Evolution and more besides have been involved here – so while the collection on offer may pale in comparison with bigger sites, there is a good enough variety to keep you coming back for more. The main site’s software is very fluid and easy to use, meaning that you shouldn’t experience any problems navigating around the main site or launching games from the catalogue while you’re here. What’s more, the CasinoLand login works great via mobile – a little more on that side of things a bit further down. There’s a nice cross-section of banking methods here, meaning that Visa, MasterCard and a range of e-wallets are all nicely catered to. Bank otherwise with Neteller, Skrill, EUTeller, Paysafecard or Trustly. Check out Ethereum casino websites as well if you’d prefer this alternative payment type. Do, however, be aware again that if you are taking on the welcome deal, you won’t be able to get any free cash if you’re using Skrill or Neteller at this time. You’ll be able to cash out with just £10, nice and refreshing for those players who are used to other online casinos requesting that they have at least £20-£30 available to take away with them – and that’s after wagering, too! Thankfully, CasinoLand Casino download games for mobile casino gaming is just as satisfying as their desktop counterparts, meaning that you’ll be missing out on absolutely nothing at all should you choose to take you live casino or slot games with you on the go. See our Captain Cooks Casino review as well for another site with mobile content. Everything morphs nicely based upon the device you wish to use, and on top of this, everything moves very efficiently and smoothly indeed. We enjoy playing games on the go with CasinoLand – and while there may not be an app for you to download just yet, there’s still plenty of reasons as to why the mobile site is worth your time and money. The CasinoLand sign up bonus and promo codes for April 2019 are very well-balanced and have reasonable terms, this is a site which is upfront with all manner of details to make sure that their players get the most out of what they’re looking for. While we could have done with a larger array of games and promotions to complete our CasinoLand review, there’s enough variety and difference here to keep most gamers very happy. Definitely take a look – read those terms – and work your way through the catalogue as it continues to grow.